I do. So the minute I saw homemade Twix bars in the blogosphere, I got to work faster than you can yell CARAMEL NOUGAT. In fact, yesterday I cranked out my favorite batch in 30 minutes flat. I’m embarassed to say I ate these for dinner. And breakfast. 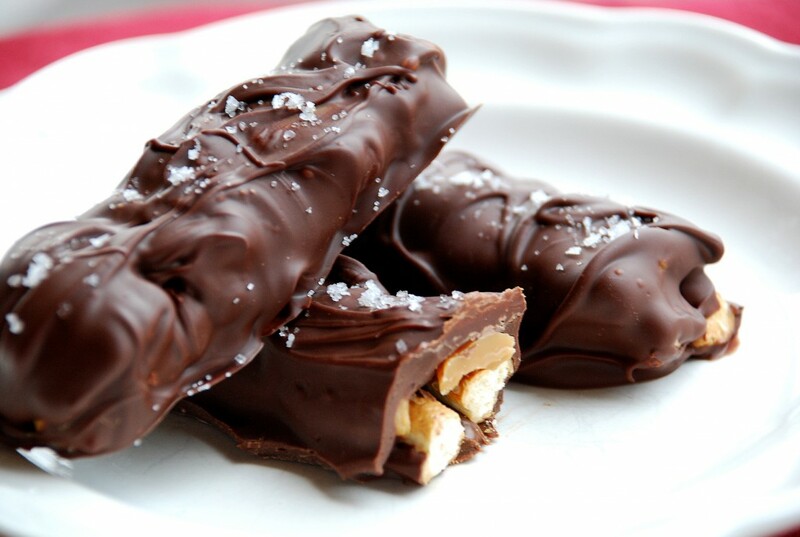 This homemade version puts storebought Twix to shame. Shame. Repeat process with all the pretzels and caramels. Spoon the Nutella into a sandwich bag and cut the tip off. Pipe the Nutella down the non-caramel side of the pretzels. Place chocolate chips and shortening in a microwave safe container and nuke for 1 minute. Stir. If necessary, microwave for an additional 30 seconds to get the chocolate smooth. Place the pretzel (Nutella side up) in the melted chocolate and gently rock to coat. Lift the bar from the chocolate and allow any excess to drip off. Place bars on pan lined with parchment paper. Sprinkle with flaked sea salt. (Regular salt will dissolve into the bars.) Refrigerate for a half hour to allow chocolate to set.